The Match Play (and Match Test) environment is the tool that is open most often during an FRC event. The screen is used to start and stop matches, disable robots, and control the Audience Display. Match number and timing information is shown at the very top of the display (yellow arrow), with time represented in total seconds (not min:sec) to match the timers on the field. The background of the "Blue Alliance" and "Red Alliance" fields (indicated by the pink arrow) will turn from Red to Green when there is a known ready state for all Robots on that Alliance (connected or bypassed). In order for a match to start, both Alliance backgrounds must be Green (known state for all Robots on the Field). 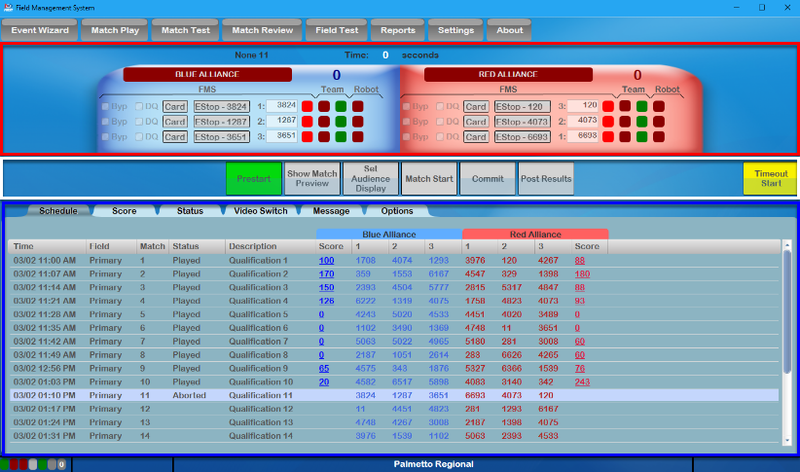 Additionally along the top bar of Match Play is detailed station information- the background color indicates the alliance (Red or Blue) and the number near the textbox indicates the station (1 to 3). The information for each Alliance is broken down into three groups, FMS, Team, and Robot (based on the titles indicated by the green arrow). Markers in the graphic are shown for Blue Alliance, though the layout is the same for the Red Alliance. Byp - Select this box to bypass this particular station and force it to a ready (but disabled) state. Estop - used to Estop the robot during the match. This box also shows the team number that it will Estop, for quicker reference. Team Number - The team number which corresponds with the team designated to play in this station. Teams need to be in the correct station to ensure that they receive the proper Station ID and Position information from FMS. Left bubble - Indicates status of the FMS-to-DS link. If the team number and DS match, this bubble with be green. Right bubble - Indicates status of the E-stop. If this light is green, the E-stop in the Team’s Player Station is up. If it is red, the E-stop in the Player Station is down, or the Estop button on FMS has been pressed. An E-stop in the down position will cause the amber light in the Team Station to turn on. All E-stops need to be in the up position to begin a match. Prestarting a match with any E-stop down will prompt a dialog box to be shown indicated in which Player Station the E-stop(s) are down. Left bubble - DS-to-Robot link status. If the DS and Robot are linked, this bubble will be green. If the station has been Bypassed, a “B” will appear in this bubble. If no link is established, the Team Light in the Player Station will flash at 1Hz (1 time per second) rate. Right bubble - Indicator would display in yellow marked area, but only shows when a Robot is connected. Mode and System state of the Robot. “A” indicates Autonomous Mode, “T” indicates Teleoperated mode. If the Robot is disabled, the bubble is red, it will be green when the Robot is enabled by FMS. Prestart - used to prep the field for the upcoming match. Prestart configures the field hardware for the six teams assigned in the Player Stations in the upper part of this screen. Timeout Start - initialize or end a timeout and show the timing information on the Audience Display and on field LED displays. Length of a Timeout can be changed on the "Options" tab. Once a match has started, the "Start Match" option becomes "Abort Match" as shown, which requires confirmation before ending a Match in progress. Some elements of the FCUI have alternate flows. Above are examples are alternate flows for "Show Match Preview," clicking an alternate (yellow) button will return the FCUI to that step. Also shown is the style for Match Start, which has additional highlighting due to the dangerous nature of enabling robots and starting a Match.